The weeks leading up to this race were challenging on the job and family front. I was in the throes of installing and debugging a wind turbine, managing our class contributions to Earth Day, advising a student group who put on a community bike ride, and editing a self-published class book. Fortunately, I was still able to get all my workouts in and do so with good focus and energy, and in many ways I believe the training is what helped me to get through this challenging time. I wrapped up many projects in the days leading up to the race and by the time I left town I felt a huge burden lifted. I got a cabin for the weekend for the family and it turned out to be very nicely appointed and just about 60’ or so from the water’s edge. The weekend was sunny and clear, with temperatures ranging from the 60s to the 80s, perfect for an early May race! Here's a bunch of photos from the weekend. My goal was to race MY race, keep my composure, be speedy and efficient, but avoid any technical snafus. 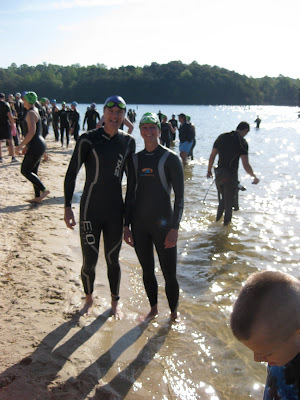 I felt relaxed heading into the swim since I had a pretty uneventful swim in the first triathlon last year, and this time I had many more months of training under my belt and the added buoyancy of a wetsuit. I was in the second wave, and at 9:05, off we went into the 64 degree water. The temperature did not seem to bother me, but being a part of the mess of rubber-coated bodies in the water was rather distracting. For the first 200 meters to the first turn buoy I couldn’t seem to get a clear area to swim in and I had this sense that the whole group was just breezing by me. My thoughts turned negative and I was surprised at how hard the swim seemed to get, considering 750m in practice was pretty routine. In the middle of my swim I broke into a few bouts of breaststroke and for one brief period, I resorted to kicking on my back wondering how I would finish and if I had just blown the race. I got to the second turn buoy and resumed freestyle, but then ended up swimming wide and getting peeved that I was wasting even more time by not swimming straight. Exiting the water I just told myself to leave it behind and do my best from this point forward. Fortunately I had THE closest bike rack to the bike start so it was easy to find and I didn’t have far to run with the bike. 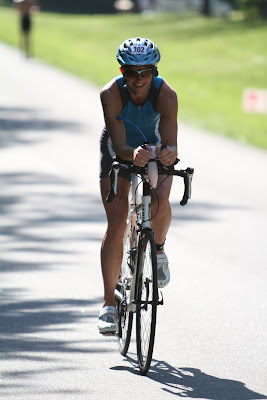 All this time I had worried about getting out of my wetsuit, but I ended up with the second fastest T1 time among the women (helped by the transition practice Jim held for us the previous week and my primo bike location). The course could not have been more to my liking with a good road surface and rolling hills. I kept thinking about the advice Jim offered: (1) wind is your enemy so stay aero (2) hammer hard, take small breaks if you need them on a downhill, but get right back to work and (3) go easy at the bottom of the hill and get more aggressive at the top. I had to remember the no-drafting rule too (no closer than 3 bike lengths, then 15 seconds to complete a pass) which was tough because it was fairly congested. I really enjoyed the bike phase and mentally it didn’t seem as tough (or maybe I didn’t push hard enough?). I passed a number of people and was myself passed by only a few, and my suspicion based on their pace is that they were the lead men from the wave behind me overtaking our wave. There were two turnaround points and I began to get the sense that there were not as many women ahead of me as I thought so maybe I was still in this race. I saw Jim each time too, working hard but efficiently, and it was a good reminder to step it up a notch. I love my bike setup, tucking into the aerobars, feeling my quads kick in, and barreling along. It’s so exhilarating!! I averaged about 19.8 MPH and I’d like to break 20 soon. Coming into the final mile, I spotted Jim’s family, then my family, and was pretty excited to know just the run remained. The flying dismount was fairly smooth and I ran the bike down to grab the run gear. The run is probably my strongest of the three sports, but that doesn't mean the run is ever easy. The early parts of this course were uphill, and coupled with the warmer temps, I felt my initial enthusiasm quickly waning. My intention (and Jim’s goal for me) was to run a 7:00 – 7:10 first mile split and save myself from going out too fast. I ran a 7:01. But rather than speed up, I ended up backing off even more, stopping at the aid station to pour water on myself in the hopes of a needed attitude adjustment. 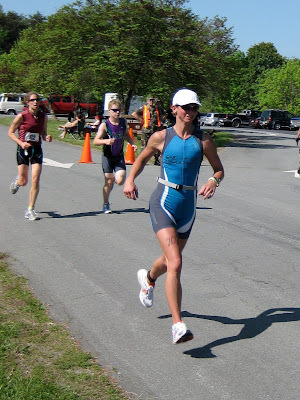 I got behind a woman in my age group and decided I needed to bide my time and wait until I was sure I could blast past her without giving her the chance to catch me. Mile 2 was a 7:37 which is pretty pedestrian for me but I continued to pick some folks off. Fortunately, I found my needed racing gear for the last mile, passed my age-group competition, and logged a 6:45. I entered the final few hundred yards and a kind spectator reminded me to pull my race number around to the front, helping me to avoid a 2 min penalty. (Note to self: make race belt tighter next time). After the race I enjoyed the company of so many folks from the NRV. It’s a heck of a strong triathlon community around here! Coach Jim topped the male master’s division, my student Leah dominated her age group, one of Jim’s 18-year-old athletes, Justin, topped his age group, and there were lots of other Hokies on the podium. One of the really fun surprises was to discover that Ryan Day, a fellow I’d just recently gotten to know as a fellow swimmer at the Blacksburg Aquatic Center, finished third overall! He’s so humble and understated, as most of the athletes really are. Even though we come together to race, it’s very much a personal quest for each of us -- to push a little harder, dig a little deeper, and further silence our doubts and fears. 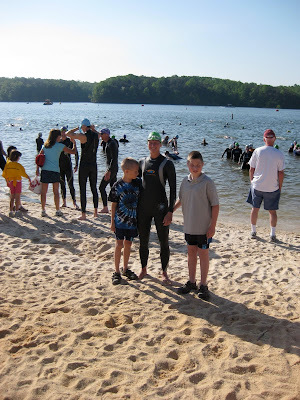 On June 5th, I will have another opportunity to sharpen up the swim at the Shenandoah Triathon. I will remember to swim at my pace and not worry about anyone else. 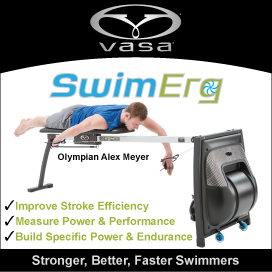 I will start way slower than I think I should, keep my cool, find my rhythm, and NOT break out of freestyle. 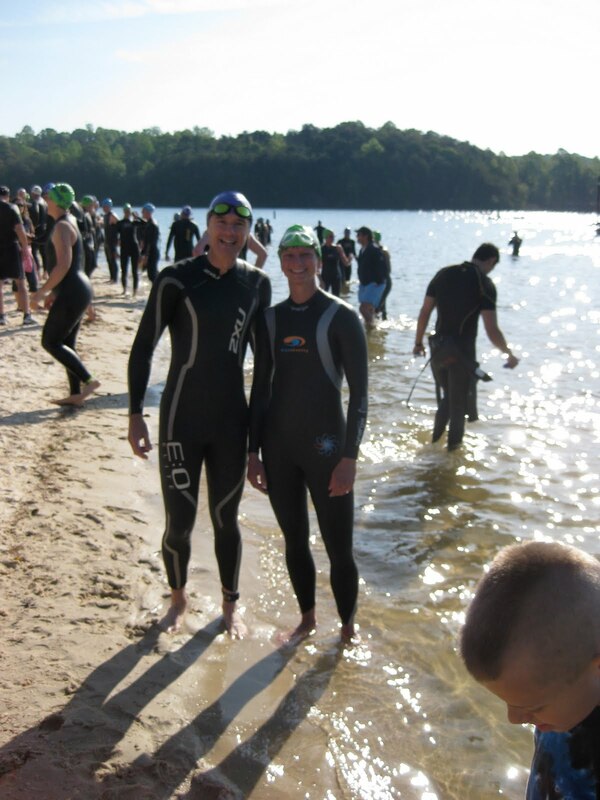 If all is going well, I can ramp it up in the latter parts of the swim, but it’s not worth the risk at the start. Leah and I with our bounty!